On the 3rd October, detention warrant issued for lawyers Özgür Çağlar, Mehmet Altuntaş, Rıza Oğuz, Sebahat Gençtarih, Emrullah Şam, Ali Bozan, Onur Kale by the Mersin Prosecutorial Office. While some of lawyers were taken into custody in their offices or homes, the remaining ones went themselves to the police HQ to surrender. After 4-day custody, all 7 lawyers were released with probation and travel ban. The lawyers taken into custody are the executives or members of the Human Rights Association and the Progressive Lawyers Association. The Progressive Lawyers Association was shut down with decree by Erdogan Regime on the November of 2016. Lawyer Erhan Çiftçiler who is member of Van Branch of the Libertarian Lawyers Association, was taken into custody on 3rd October in the province of Van and after 2-day custody, He was released with probation and travel ban on 5th October. The Libertarian Lawyers Association was shut down with decree by Erdogan Regime on the November of 2016. As of 9th October 2017, 550 lawyers have been arrested (since 15th July 2016) and 1398 lawyers are under prosecution. So far, more than 20 lawyers were sentenced to long imprisonment. Some of the arrested lawyers were subjected torture and ill-treatment. So far; Erzincan 2nd High Penal Court sentenced lawyers Cemalettin Ozer and Talip Nayir who are (respectively) former president of Erzincan Bar Association and former board member of association 8 years 9 month and 10 years, Eskisehir 2nd High Penal Court sentenced 11 lawyers to range 4 to 12 years. Also Sivas 2nd High Penal Court and Adana 11th High Penal Court sentenced lawyers to ranging from 3 to 9 years imprisonment with charge on being member of armed terrorist organisation. All persecuted lawyers are being charged with terror linked offences such as being member of armed terrorist organisation or to run armed terrorist organisation. Pursuant to Turkish Penal Code, these two offences require 7,5 to 22,5 years imprisonment. In addition to these lawyers, at least 149 public (gov’t) attorneys & legal advisers, 108 law schools academics were dismissed with emergency decrees, most of them were also detained or arrested. As the most recent ring of Erdogan’s persecution chain, nine respected human rights defenders including the chair and director of Amnesty International Turkey Branch were arrested. 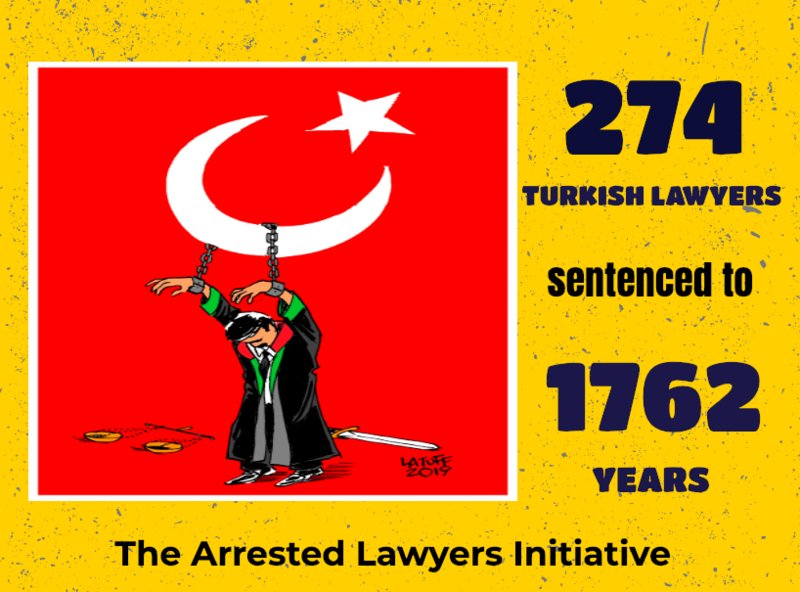 Also, 5218 judges and prosecutors were dismissed and they were subsequently arrested. There are still 2600 judges and public prosecutors in prison with nearly 680 of them in solitary confinement. According to The World Justice Project’s annual report entitled “Rule of Law Index 2016″, Turkey is on 99th rank amongst 113 countries. Turkey is on 105th rank in terms of “fundamental rights” and on 108th rank in terms of “constraints on government powers” amongst 113 countries.